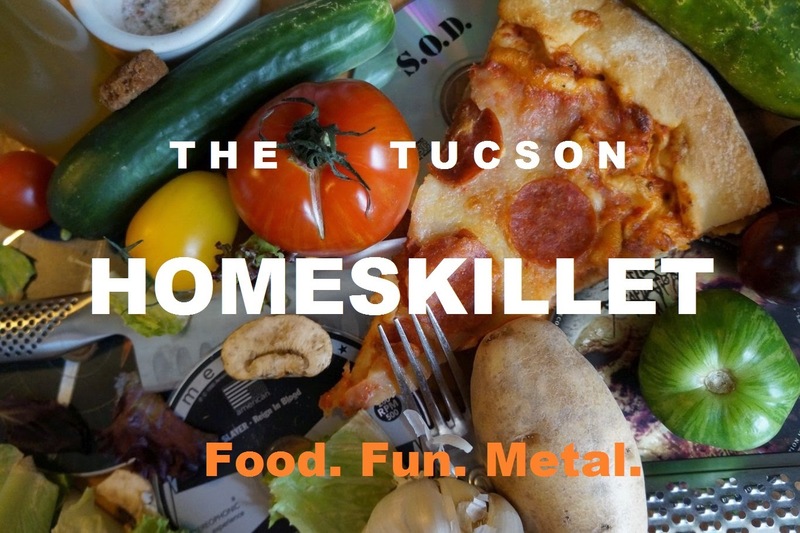 The Tucson Homeskillet: Homeskillet restaurant review: Monkey Burger! 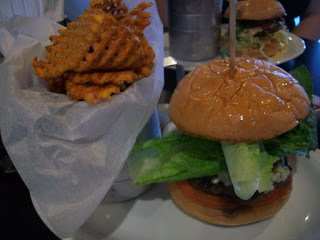 Homeskillet restaurant review: Monkey Burger! Yeah, yeah, yeah....I know. When I started this here fooder blog I told not only myself but you guys as well that I'd be uploading a Homeskillet blog at least once a week. Well, I'm here to tell you children, between work, trying to gather up ideas, concepts and locations (and $$$) for our still-unnamed bar/restaurant alongside She-Ra's side business of training servers in restaurants known for great food but rotten service and my own culinary training and such, it's tough to take pictures of every meal and every recipe and flop it on up here in the intrawebs for you to read and enjoy. But!, a recent outing has inspired me to set aside a bit of time to work ye olde typer and let you know what's going down with our latest eating adventure. Now, everybody loves a good burger. Even vegans. That's why they have “vegan option” patties, non dairy cheese and, get this, I found a recipe for vegan bacon using tempeh. Oh yeah. For those that don't like meat....they wanna eat meat. Now, I'm not gonna get on my “just shut up and eat a steak for craps sake” soapbox, but I do wanna say that we found ourselves dining at a relatively new place that has already garnered rave reviews, Best Of and the like. Here in Tucson, if you follow new and trending restaurants, inventive chefs, outrageous concepts and the “cutting edge” in downtown dining, one thing that always comes up in articles and word of mouth is how amazing the food is at Monkey Burger. Apparently, this is a chef run operation, like a professionally trained culinarian had the idea to make a serious buck, and that's to open up a burger joint so good that the critics and meat fans alike will literally fall at your feet and worship the grease stained clogs that they don on their feet. After some deliberation, a 'just happen to be in the neighborhood' coincidence and, yes, a Groupon, we ate at their flagship set up on Broadway. Nestled between a ladies boutique and an insurance brokerage, Monkey Burger doesn't seem like the place to collect raves and rants, but more like a bodega style eatery made to rush you in and then rush you out. Mind you, I've had some incredible food, some of the best, located in near invisibility in strip malls so I was totally open to the notion that heaven can lay not only between two buns but faceless businesses on the side of a busy byway. When we walked in we were hit with the fact that the place is sorta set up like a Chipotle. It was a little stark, no music playing, with a basketball game turned up on the one TV over the “bar”, and when I put bar between parentheses, that means it a few chairs set up under a counter which stands in front of three tap handles and a clear glass kegerator under that TV. “I can take your order here,” she interjected. And that's all she said. Um, the place was empty. An elderly couple was chomping on what looked like amazing burgers and a guy, most likely a “server” that just got off work (because the cashier, the always-checking-his-Blackberry typical useless manager were talking to him about the day and, yeah, he was in a Monkey Burger tee-shirt) was eating at the bar. I mean, how hard could it have been to ask us to have a seat while we make our selection, take our order and then bring it out? Sure, if it was slammed busy, yeah, I'd stand there studying the super parred down menu and expect shortness in formalities and longness in getting our food to the table. But it was 4pm, post lunch and pre dinner deadness and we stood there like dorks going over a menu we had never seen before. In fact, the cashier (or waitress or whatever she was) looked as if we were kinda taking up her time doing nothing by standing there trying to decide on what to order. So eventually we settled on two that we could split and share. First one was one called Madness, which features a sliced jalapenos, pepper jack cheese, Tabasco, fajita peppers, a scallion aioli and lettuce. We like it spicy and we hoped this one would deliver. The other was called True Blue which has blue cheese, caramelized onions, grilled tomatoes and Romaine. Some people hate blue cheese, saying it's too stinky, strong in flavor and looks like moldy dust bunnies all squished together. And I say...hell yeah! True blue cheese has to kinda smell like grandma feet and taste like savory and salty tomb morsels. Love it. For the sides we selected housemade chips and their sweet potato waffle fries. Yum. Even though they have like five beers, the five beers they do have are pretty good. I got a Hazed and Infused hoppy ale on draft and She-Ra got a Session Black Ale in bottle. They also had Tetley's English ale, Murphy's Irish stout and Green Lake Organic Ale. Not bad for a small little establishment. And I do mean small. I'd say maybe a few two seaters, a couple of fours and five or six seats at that bar. Fifty people would make it seem packed. Sixty and they're spilling out onto the street. Which is why we started asking ourselves why that server chick couldn't just have us sit down, walk over and take our order which would make the kind of cold, even with all of the ratty graffiti art on the walls, seem a bit warmer. But, we were hungry, enjoying our post “Bridesmaids” (that movie was awesome!) beers and lunch (I know it was 4pm but we didn’t wake up till noon and have breakfast seeing as it was our day off, so...yeah) and were getting pretty excited about the food that would be arriving shortly. Which looked equally incredible. So we cut the two burgs in half and set one part on our plates. I gotta tell ya here, that first bite of the True Blue, since it was right in the center, was fantastic. Perfectly cooked medium rare-ish Harris Ranch ground beef with piles of blue cheese, tomatoes and onions just melted in my mouth. 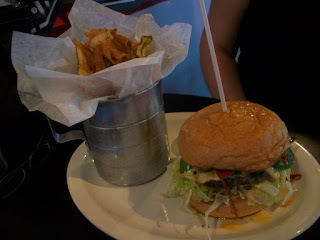 It was incredibly juicy without being greasy, which is important for a burger themed restaurant. She-Ra was impressed as well with the Madness. Good heat, succulent peppers and beef, nice contrast from American comfort to South of the Border influence. Oh yeah, we were pretty happy. And those housemade chips and sweet potato waffle fries? Unreal. Everything was really doing a good job. But then, as the burgers began to thin out, we kinda noticed a few important flaws. Like the True Blue, it was mostly grilled onions. The small pile of blue cheese was obviously just lumped right there in the center. And the Madness, while it was pretty fun, tasted more like a taco salad between two buns rather than a 1/3 pound burger topped with a fiesta of flavor. The meat just kinda got lost with all of the toppings and those lettuce leaves were kinda of in the way. Mind you, you can upgrade to a ½ pound patty but its gonna cost you. So while that first maybe second bite of our burger impressed us, after a while they just kind of disintegrated into a strange, but kinda tasty, mush. The buns were good though, so that was a bonus. Light and fluffy, they contoured to the fillings and your hand and were the perfect vessel to get that stuff to yo face. But with all of the recent hoopla and awards, we were really expecting something spectacular. But hey, in a recent poll of Best Ofs here in Tucson, PF fxxking Changs won “Best Chinese Food”. I mean...are you joking? Does the voting public go anywhere else but corporate run restaurants? Apparently not, because I'm always busy. Recently I got word from my old stomping grounds in San Francisco that a U2 cover bad, Zoo Station, won “Best Local Band”. Goes to show you that you really do need to make the effort and get out and vote. Monkey Burger's burgers were good but we were left feeling a little let down. Plus after I took a photo of each burger and She-Ra and I quietly discussing (could a little music hurt you guys?, c'mon!) what we were eating, the manager kept hovering over us making sure everything was alright. And that's the impression that we got: It was just alright. Mind you this is just the one up on Broadway, we haven't tried the one downtown. If we are in that neck of the woods and craving a $9 burger, we'll probably pop in and order a completely new set of burgers to try. Who knows? The Chi-Town and the Sonora sound kinda good. But can they get over the fact that too much topping and fillers kinda kills the promise of a juicy and fantastic burger? I hope so. And I always have hope. Which is kinda of a downfall. Especially with overhyped restaurants. So there you go. My initial impression and take on the ever so (or maybe not so) popular burger shack Monkey Burger. You can check it out online here: http://monkeyburgerrestaurant.com/index.html If you go there tell me what you think about it. Maybe we ordered the wrong thing at the wrong time. I don’t know. People rave about Empire Pizza downtown and while the food was good, the service was crap. Like absolute garbage. Looks like She-Ra has her work cut out for her and her new Server Solutions gig. And I have my work cut out eating at new places that everyone is squawking about. Its a rough job but, sigh....somebody's gotta do it.